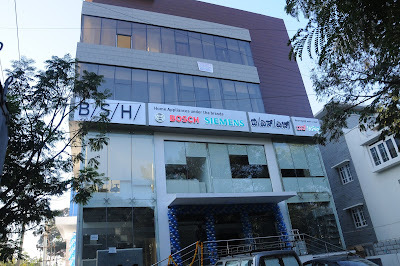 Siemens Home Appliances, Germany’s number one brand and Europe’s market leader in built-in kitchen appliances, has inaugurated their 2nd corporate showroom in India at J.P Nagar, Bangalore After receiving an applauding response from the corporate showroom in Mumbai, Siemens Home Appliances expanded its experiential offering to the tech hub of the country. The exclusive 726sqft. Corporate showroom has a lot to offer as it will showcase its high-end built-in appliances like Combination Microwave, Microwave, Induction Hob, Island Hood along with Dishwasher and Refrigerator. All these products will be live and one can come and experience their features and best in class technology before making a purchasing decision. The store is located at opposite Renault Showroom, Bangalore allowing the customers to try the live products before buying them. Commenting on this exclusive showroom expansion, Gunjan Srivastava, MD and CEO, BSH Household Appliances Manufacturing Pvt. Ltd. said, “Siemens has seen a phenomenal growth in India since our entry in 1997 and has continued to deliver an ace lifestyle to the Indian audience. Experience always speaks for itself and hence we believe that an experiential showroom will help reinforcing our brand quality and value among customers. South has been a key market for us, Bangalore being the silicon valley of India, the showroom launch we aim to increase the accessibility to innovative appliances. The Siemens corporate showroom will offer an array of products in the built-in and free standing category that would define the ultimate in lifestyle for customers in Bangalore. They provide a full range of premium products and services with an integrated solution. The flexible fitting and the cutting-edge design of Siemens built-in appliances, provide easy integration with the kitchen furniture and home architecture. The free-standing products have built-in intelligence which ensures it saves energy, reduces input and maximizes output. Siemens has always been a pioneer in innovation, design and technology for which it has been bestowed with various international awards. All the Siemens products involve detailed research and testing right from its conceptualization to manufacturing and thus ensure complete customer satisfaction. The products are a combination of superior technology with visually aesthetic designs. The Siemens showroom is at No.- 8, Ground and Mazzanine floor, 15th cross, 6th phase JP Nagar, Diagonal opposite to Renault showroom, Bangalore- 560078, Karnataka. Siemens Home Appliances is renowned for constantly taking up technological challenges and enthused by developing forward-looking products, solutions and services. It combines the latest technology with improved functionality that results in pioneering products and solutions into benefits its customers can see and experience. Setting these benchmarks in the market, Siemens products cater to the most demanding and wide-ranging aspirations of a modern lifestyle. These superior standards are a result of Siemens’ decade’s long experience in manufacturing home appliances, ensuring that its products meet the most specific customer requirements.